The city of Korcula is situated on the island with the same name. It is named after a hero from Greek mythology, Kerkyra. This charming island with many rich vineyards and olive plantations is one of the most beautiful green islands in the Adriatic Sea. Historic city of Korcula, which belonged under the rule of the Dubrovnik Republic for centuries, it is certainly worth visiting. The city of Korcula is the administrative, commercial and educational center of this part of Dalmatia, and it is only 15 minutes of boat ride away from Peljesac peninsula. 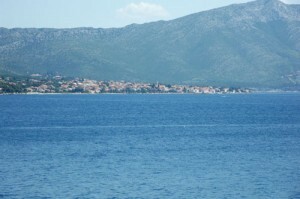 As it is on island, access to the town of Korcula is possible only by water. But transportation shouldn’t be a problem, as this island has many regular ferry lines connecting it with the mainland. Korcula is accessible by ferry from Split or Dubrovnik, and also from the town of Orebic on the Peljesac peninsula. There are some well-preserved walls and towers, which were used to defend the city from invaders, but today it is only tourist attraction. In the old part of town, the Cathedral of St. Mark is worth visiting. It which was built in the 13th century by local people. In its rich history, the cathedral has undergone several changes and today it is one of the most beautiful religious monuments in Dalmatia. Korcula was home to the world-famous traveler Marco Polo, whose house you can still see. Korcula is also known for the traditional medieval game Moreška, which is carried out during the tourist season, in memory of the Turkish raids. Turkish raids were not the only conflicts in this part of Dalmatia. The historical important is also a maritime battle at Korcula in 1298, where ships from Genoa defeated the Venetian fleet. This was one of the many battles of the time when the city of Venice, Genoa and Pisa fought for commercial supremacy over this part of the Adriatic. It is said, that among the other hostages in this battle the winners Genoa also captured traveler Marco Polo, who described the battle accurately. 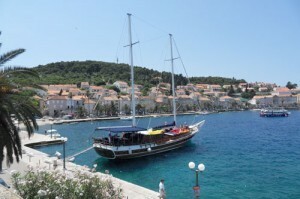 But historical and cultural attractions are not all offered in the town of Korcula. Due to its indented coastline, there are 182 kilometers of coast, you can discover on foot or by boat. You can be sure that in many bays you can easily find peace and solitude you’re looking for. Private apartments, hotels and cams will provide you great possibilities for accommodation, even in the peak of tourist season. Friendly locals will give you an opportunity to taste Dalmatian dishes and wines, which will complete excellent vacation in this part of Dalmatia.